The first batch of Raspberry Pi computers are being issued to users. A group of schoolchildren in Leeds are the first to get their hands on production models of the bare-bones computer. Costing only £16, the tiny computer has been designed to inspire anyone, especially children, to get started with computer programming. Eager fans who were the first to order a machine should get their Raspberry Pi by 20 April. 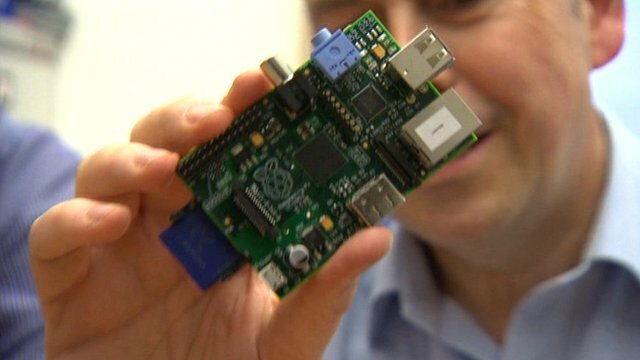 Since the Raspberry Pi project began, the plan has garnered huge interest from developers, hobbyists and others keen to get their hands on a cheap, easy-to-use computer. Delivery of the first batch of production machines has been delayed twice - once because the wrong component was soldered on to circuit boards and a second time thanks to confusion about electromagnetic testing. With both these hurdles overcome, delivery of the first machines to roll off the production line is set to commence. To mark the occasion, project co-ordinator Eben Upton is presenting a batch of the first Raspberry Pi computers to schoolchildren on Friday. The event is being held at the Leeds offices of Pi distributor Premier Farnell. Dr Upton will also be holding a programming masterclass to help the children find out what they can do with the machine. A spokesperson for Premier Farnell said it was due to get a large batch of machines delivered on 13 April and would be sending them out to customers on Friday. Those who were the first to order a Pi should get their gadget within seven days of them being sent out, she said. The Pi is built around the Arm chip that is used in the vast majority of mobile phones. It runs one version of the Linux operating system and uses SD cards as its storage medium. The machine comes in two varieties - with and without a networking connector.